Spoiler alert...Every team in the organization lost on Sunday. Now that that's out of the way, there were still some very strong performances. Three of the four minor league affiliates were within two runs or fewer. There were also some strong starting and relief appearances from minor league hurlers. Rochester found themselves in an early hole. Zack Littell got knocked around for four first inning runs. He would settle in a little from there and pitch into the fifth inning. He ended up allowing five runs on seven hits while striking out two and walking two. The Red Wings were limited to six hits with only two of them being for extra bases. Jordany Valdespin went 2-for-3 out of the number nine spot in the order. He was the lone Red Wings hitter to collect multiple hits. John Andreoli reached base two times including his first double of the season. Randy Cesar collected his second double. Andrew Vasquez pitched 1 1/3 innings and struck out four. No… that’s not a typo. Ryan Eades ran into some trouble in the final frames. He gave up two runs on three hits in a little over two innings. Griffin Jax was strong, but the Blue Wahoos lost for the first time on Sunday. Jax stranded base runners in all five innings he worked and left the game with a 1-0 lead. Blue Wahoos starters have allowed one run in 20.0 innings so far this season. Pensacola didn’t collect an extra-base hit for the first time this season and the club was limited to four hits in the entire game. Pensacola actually scored first in this one as Drew Maggi scored on a fielder’s choice by Brian Schales. That would be the lone run for the Blue Wahoos. It turned into a bullpen game for Pensacola. Jeff Ames took over for Jax. He allowed one run on three hits in just under two innings of work. Tyler Jay pitched 1 2/3 innings of scoreless ball. He was followed by Dusten Knight who tossed two scoreless frames with a pair of strikeouts. Sam Clay took the loss but it was more to do with the runner starting on second base in extra innings. Royce Lewis helped to get things going in the first inning. With one out, he walked and then stole second, which one was of two steals on the day. Trevor Larnach advanced Lewis to third before Jose Miranda drove him in with an RBI-single. Bailey Ober was the story of this game as he dominated on the mound. In six innings of work, he scattered four hits and allowed one unearned run. He struck out 11 and walked only one. Calvin Faucher took over for Ober and was just as good. He struck out four in two innings and limited the Stone Crabs to one hit. Calvin Faucher pitched two scoreless frames and limited Charlotte to one hit while striking out four. Alex Phillips took the loss. He allowed the runner to score from second base in extra innings. However, he struck out four in 1 2/3 innings of work. After trailing 2-0, the Kernels scored a pair of runs in the top of the sixth to tie the game. Joe Cronin walked before a Michael Davis singled moved him into scoring position. Gilberto Celestino plated a run with a line-drive single to cut the score to 2-1. DaShawn Keirsey singled to tie the game, but that’s when the scoring stopped for Cedar Rapids. 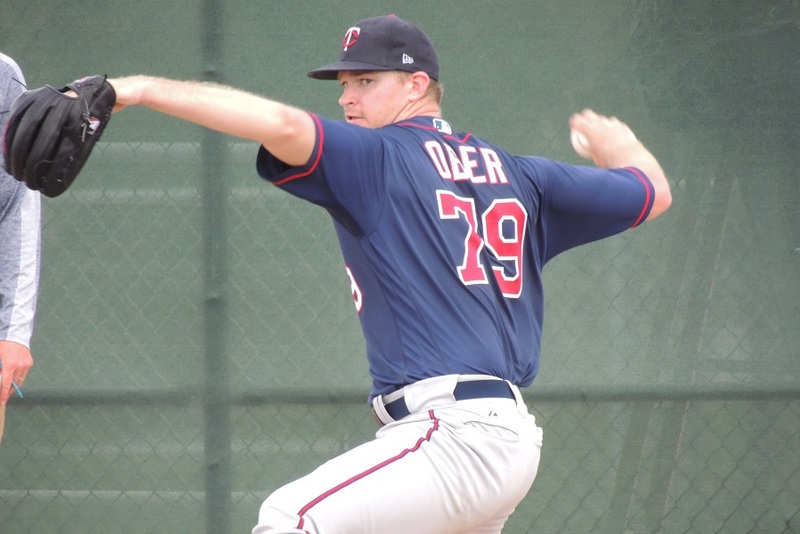 Josh Winder started for the Kernels and pitched five innings. He allowed two runs on five hits while striking out five and walking three. Joe Record was saddled with the loss after he surrendered two unearned runs in less than an inning of work. Well, great job and a mighty "Huzzah!!" to Jax and Ober. Go Get em' tomorrow boys. Yeeesh....perusing that prospect summary list. It looks, well....in a word, ugly. Well, there's always games tomorrow! Gah. Lost three 2 to 1 games in the system today. Without Gordon, Gonsalves, Javier and Kiriloff on active duty.... and with many, many of the others getting off to such poor starts, there's not much on the farm to get too exited about. Were Zach Littel and Ryan Jeffers merely mirages in 2018? Rooker and Larnach REALLY struggling..... but it's early, thankfully. Andrew Vasquez pitched 1 1/3 innings and struck out four. No… that’s not a typo. What are the chances that Vasquez can force himself up and into the Twins bullpen this year? Will be interesting to see where Moya goes when off the IL.Could Vasquez be surpassing him as the next lefty called up to the big club this year? Great starts by Jax and Ober, really great start by Ober with 11 K's in 6 shutout innings. I see elsewhere that Sano is nearing his rehab assignment.Expect it will start with a couple EST games before sliding over for a few games with the Miracle.I see the Blue Wahoos (gonna have to get used to that name) have a 5 game homestand against Mobile from the 20th (a week from Saturday) thru the 24th.Will be real surprised if he isn't in that series as the weather in upstate New York can still be questionable at that time.Also would be real nice to have a player with Sano's status getting into a couple games for a club new to the organization.Could then either move on to the Twins or to Rochester on the 25th...who will then be at home versus Pawtuckett.Looks like he should be back by May 1.Will be curious what move the Twins make to open a spot for him. Great start for Ober. I hope his injury stuff can be put behind him as he has looked pretty darn good when healthy. Let's see how he does in the minors first. He may be down there longer than people hope. Royce Lewis helped to get things going in the first inning. With one out, he walked and then stole second, which one was of two steals on the day. Yeah! in this high-tech era of advanced metrics or stats or whatever is being used to evaluate players nowadays, I still love seeing players like Lewis steal bases. Exciting baseball! Anyone know when Kirilloff will be back? Some sort of injury. Was considered mild I think. But haven't heard anything about when he'll return.